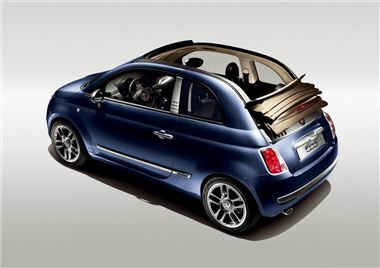 Fiat has launched a special edition of its 500C in collaboration with designer fashion brand DIESEL. The 500CbyDIESEL is based in the Fiat 500C Lounge and comes with a choice of (rather confusingly) 1.2-litre and 1.4-litre petrols along with a 1.3-litre MultiJet diesel engine. It comes with a range of unique features such as 16-inch special alloy wheels with DIESEL logo, burnished metal-finish front and rear bumper inserts, DIESEL logos on the side pillar moulding and at the rear while unique paint colours include a new Midnight Indigo Blue, a shade reminiscent of stone-washed denim jeans. Inside there are further distinctive extras such as special DIESEL branded upholstery in denim fabric with yellow stitching, a leather steering wheel with yellow stitching and a DIESEL logo on the gear lever. Like the Fiat 500C Lounge, the 500CbyDIESEL will also be fitted with automatic climate control and rear parking sensors as standard. Prices for the Fiat 500CbyDIESEL start at £14,865 on the road, for the 1.2-litre version and rise to £16,265 for the 1.4-litre and £17,265 for the 1.3-litre MultiJet. It's on sale now.